Hello dear Mr Alisher, Ms Ayumi and all TRUST CO., 1 year passed, after I started work with you. It was very satisfying and good result year!!! Just to thank you for well done job and i would like to inform that i received my vehicle in good condition. This is to appreciate the way you do business and good quality work you do, i received my vehicle Nisan Serena […], i will be doing more businesses with soon. I have now received my Toyota Corolla Car yesterday (17th Sept -12). It is a nice car and working really well. Keep up the good work of service to your customers. 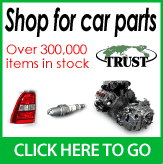 I hope in future I can be able to order another vehicle from Trust Company Ltd. Thank you again. I would like to advise you guys that I have received my vehicle in perfect condition yesterday afternoon from our local Customs Agents, took it for a drive and was really satisfied with it. My wife and daughter was so happy, we’ll register the vehicle today. You guys truly are the Trust Company as the name said it all, I won’t hesitate to do business with you in the near future, and I already recommend you to my family, friends, and relatives to get cars only from your company. Thank you and may God bless you and your company for the years to come. Greetings from me and my family, sorry to reply to your email late anyhow the message is still fresh. I received the Elgrand and thank you[...]. Find attached my family photos. am very glad to receive the IST in a very good condition. Am very gratefull for your services with the help of Lusaka office. The Archdiocese of Lusaka received the above vehicle in good condition. It is very stable on the road and is certainly a very good buy. Continue providing the good service to all. Thank you very much I received the car on 27/09/12 exactly on the prevision date. The car arrived in good condition. I hope to contact you soon to look for another toyota corolla manual transmission. commitment and loyalty. We have received Toyota Avensis [...] and it performs well. It is nice and have received all the extras including the radio, cassette, TV and CD. Just keep the up the good work. I confirm to have received the car and I thank you for choosing a very good car. Hi, i purchased a toyota regius for my lovely wife. We received the vehicle intact & in excellent condition. The personalised customer service from TJV is incomparable to anyone. You are beyond trust in your servive delivery. Its par excellence. My vehicle (the above unit) arrived safely in Lae on the Monday 10/09/12 and it was delivered to me the next day. It's a very nice family wagon & I am pleased with the vehicle it's just fantastic, runs great & looks wonderful. I would like to thank you & your Trust Team for the kind assistance for the safe arrival of my vehicle. Thank you very much & keep up the good work, I will contact you again for more vehicles. Please pass my sincere thanks also to the Trust Shipping Team. Sorry for my delay, Many thanks once again to you, and all Trust Team they are good and perfect and i am happy with them. I received the vehicle in good condition it is a nice vehicle I love it. I thank you for doing a good job. I've collected both vehicles and they are all in good condition. Both vehicles drive really great. Thank you very much and you have a lovely weekend. We are grateful , we have received our vehicle on the 6th September 2012. We have received the vehicle in good running conditions, you have an excellent service. [...] We thank you once more for your impeccable services. Without wasting your time i would like to say that I do deeply appreciate doing business with your company. I have just received my Toyota mark ii looking and performing just great, thanks indeed. In fact many friends of mine are impressed and they have shown great interest.I believe very soon I will get in touch with you. This email is to let you know that my cars arrives safe and everything was ok. Thanks for all your attention.